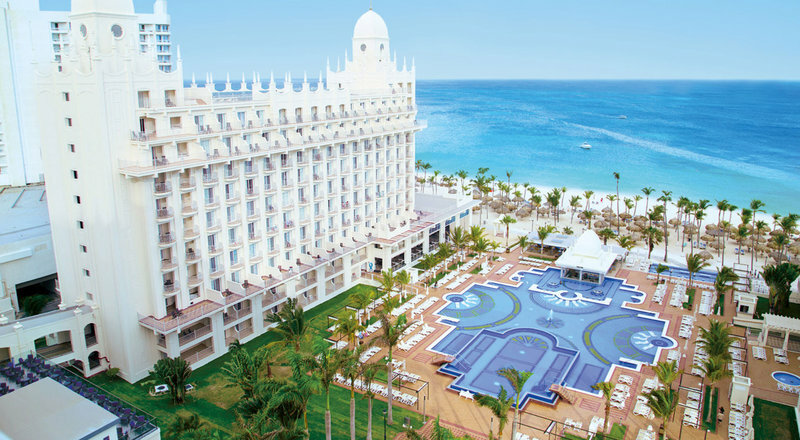 The Hotel Riu Palace Aruba is located on the side of the island known as Palm Beach in Aruba, with white sand and crystal clear turquois water. If you’re looking for the perfect family vacation or just with friends this resort is a balance between elegance and entertainment, the Hotel Riu Palace Aruba is the place for you, as the All Inclusive system provides the best activities, entertainment and fun. Two swimming pools, one with adjoining whirlpool bath, Children’s swimming pool, Free sun loungers, towels and parasols by pool area and beach and a beautiful sun terrace. Non- motorized water sports are available all day long. If you are a gulf enthusiast this destinations offers you a major course not far away that is both challenging and beautiful. If you are a diver the crystal clear ocean is the perfect place to have the best dive of your life. The Renova Spa” health and beauty center has a variety of treatments, hairdresser, and beauty salon and massages (additional charge) is ready for you. Free gym, sauna and whirlpool bath. The entertainment team will also many activities for you to participate in during the day. At night you can listen to live music, see a show and try your luck in the casino. The hotel´s range of cuisine includes a buffet restaurant and four themed restaurants with a wide variety of dishes to satisfy all palates. Room service 24 hours a day, Don Nicolás” restaurant with terrace, “Krystal” Fusion restaurant, “Sayuri” Japanese restaurant, “Milano” Italian restaurant, “Nautilus” poolside restaurant/grill and steakhouse with terrace, Capuchino” pâtisserie & ice cream parlor, plus 24 hour room service. There are also several bars at the swimming pool the Palm Beach” poolside bar with swim-up and at the beach so you can refresh yourself whenever you like, also the “Bon Bini” lobby bar, “Barry’s” bar with terrace, Casino bar (not included in All Inclusive), Sports bar (open 24 hrs, All Inclusive service). You can choose your accommodations from the 450 rooms and suites. All accommodations have free Wi-Fi, safe, stocked min-bar, liquor dispenser, and balcony.